Reading some discussion of Factory Idle online led me to Reactor Idle, an earlier work by the same artist, themed around building power plants. Reactor Idle doesn’t have conveyor belts — its simulation is more about heat transfer and making sure your buildings don’t catch fire. But other than that, the games are strikingly similar in a lot of ways, starting with the look and feel of the UI. Both games are based around a system of two goal resources, money and research. Money buys buildings and globally upgrades them, while research unlocks new kinds of buildings and upgrades. You need them both, because research gets you to the next tier of money-making and money gets you the buildings that do the research, but there’s no obvious answer to the question of how much you should be spending on upgrading each. Also, both games have a thing going on where very large quantities of money will buy access to new areas, called “plants” in Reactor Idle and “factories” in Factory Idle. It seems at first like these areas might be levels, different disjoint spaces that you complete by getting enough money and proceeding to the next, but it’s more interesting than that. Your money and research pools are independent of which area you’re in, and all areas keep on producing money and research when you leave them. So it’s more like these areas are all just further expansions of a single industrial empire, except for one unexpected twist: Although your research carries over to all areas, your upgrades do not. Each area must be upgraded independently. This is enough of an oddity that I’d suspect a connection between two games that did it even if the connection weren’t already so obvious. This special rule suggests that different areas can be upgraded differently to pursue different specializations. 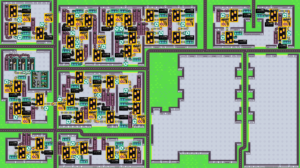 And indeed, I’ve pursued that quite extensively in Reactor Idle, where I’ve given over the initial island entirely to research, filling every buildable tile with research buildings and upgrading nothing else there. This is a viable approach in that game because research buildings consume nothing but the land they sit on. 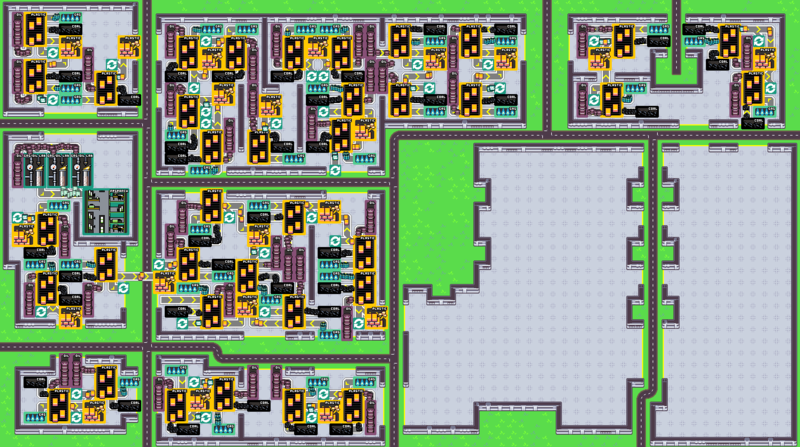 Factory Idle makes things more complicated. Research buildings there require money to run, and conveyor-belt feeds of factory-produced items to run optimally. Thus, a certain amount of factory production upgrading seems wise even in a research colony. But I’m still doing specialization on other channels: I didn’t bother upgrading steel production at all in my second factory, having already researched the much more lucrative plastics. Discovering two games of this sort in a short period of time has had one strange effect. As I’ve noted, idling games are best played in the background, as something you can check on periodically while doing something else. And while these two games have a greater than usual amount of non-idling time, they do eventually develop stretches where you’re just waiting for your money or research to reach some threshold. But by playing both of them simultaneously, I can be actively playing one game while waiting on the other. In effect, it eliminates downtime by having multiple channels for action, even though there’s downtime on each of them. It strikes me that this is something that could be exploited even within a single game. It’s one of those times again when all other gameplay is preempted by something new on the Internet. Factory Idle is an automated factory simulator along the lines of Infinifactory, but it’s presented as an idling game. A closely related genre to clickers, idlers are games where resources automatically increase over time, and the player spends them on upgrades to make them increase faster. Usually they’re very abstract: you click a hyperlink to buy a factory, say, and the number by the word “factories” increases by one, as does the rate at which you produce whatever the product of the factories is. Factory Idle adds a layer of physical constraint between the raw numbers and their effects. You have to place the variously-sized components of your factories onto a grid, with conveyor belts connecting them. Optimizing the use of rooms with different dimensions is an enjoyable challenge, and one that has to be redone frequently, as upgrades change the optimal proportion of components. For example, when I first built a plastic maker, I had to give it the full output from two oil buyers, two gas buyers, and two coal buyers to get the most use out of it — which you definitely want to do, because the plastic maker costs the same amount of money to run whether it’s producing optimally or not. Then I upgraded the plastic makers so that they were twice as productive, and thus needed twice the number of inputs hooked up to them. So I wiped all my rooms one by one to lay them out differently. You can spend a lot of time fiddling with your layouts in this game, tweaking them to get just a little more free space that you can jam another component into. And for that reason, I’ve seen the game praised by people who don’t normally like idlers. You don’t have to wait for it! There’s always something to do! (Until there isn’t.) But the same words mean that it kind of fails as an idler. I’ve played other idling games before, and let me tell you, you don’t play them the same way you play other games. Idlers exist to be played while you’re doing something else. You’re at work, or your’e writing a blog post, or something of the sort that requires attention and keeps you sitting in front of a computer, but the mind requires occasional distraction. So you have something you can check on every so often. You can use Twitter or Facebook for this purpose, or you can use a game. And when you’ve checked on your idler, and seen that you can finally afford that one upgrade you’ve been waiting on, and clicked to buy it, you can go back to what you were doing before. Factory Idle is frequently too involved for that. It seems to be slowing down as things get more advanced, as idlers and clickers often do. The moments when I redesign everything aren’t as frequent as they were at the beginning. But at the same time, my factory is a lot larger than it was back then, so each major redesign takes more time and attention, more suited to lunch breaks than microbreaks. Another day, another level. That seems to be how fast I’m getting through this game right now, on those days that I play it at all. One level = one session is a reasonable equation, but I feel like my lack of binging, especially as I approach the end, signals a flagging of interest. The latest level was chock-a-block with land mines and other explosives, with large numbers of Slig guards, including a new, larger type, a sort of Slig giant with a more powerful gun and a more blatantly robotic lower half. None of this made the level more interesting. It just made it take longer. Nonetheless, I do want to finish the game, if only to justify to myself moving on to Stanger’s Wrath, which is of particular interest to me simply because I know so little about it. I hadn’t even heard of it before it wound up in a Steam bundle. So for all I know, it may be even more dreary than these later levels of Munch’s Oddysee. So, Munch’s Oddysee has these vending machines dispensing power-ups in the form of soft drinks. Some can be used by both player characters, some are exclusive to Munch. A drink called “Expresso”, for example, makes either character run faster, while “Zap!” lets Munch attack nearby enemies with electrical arcs from his cranial implant. Health can be restored with cans of SoBe energy drink, from vending machines with the SoBe logo with the two lizards. I’m informed that this isn’t the case in all version of the game. Apparently there’s a HD remake for Playstation 3 and Vita that uses a made-up “Health Up!” brand name instead. But in the version I’m playing, it’s SoBe, except for one Health Up machine I’ve seen. I don’t know what the deal is with that. This is far from the first or worst instance of egregious product placement I’ve seen in games. The example I always think of is Lemmings 3D (aka 3D Lemmings), which stuck Jelly Belly logos all over the place, and even made a huge jar of jelly beans into a major part of one level’s geometry. To this day, whenever I see Jelly Bellies, I think of Lemmings, which is presumably the opposite of what was intended. I also think of the obscure 2002 action-adventure Darkened Skye, which was actually designed from the ground up as an advergame for Skittles, even basing its content on then-current Skittle commercials and including a Skittle-based magic system. The truly remarkable thing about Darkened Skye, however, was that, unlike most games based on junk food, it tried to hide it. The packaging mentioned Skittles only in the small print on the back, and you could play it for a couple of hours before encountering any Skittle content. Today, it’s remembered for nothing else. And that’s why I feel the way I do about product placement of this sort: that it’s the sign of a game that’s lost its way as art. It’s letting money dictate content. Well, okay, that’s going to be the case regardless. Budgets are limited, and studios need to make games that will sell. But this is letting money dictate content in an obvious and intrusive way, and I have to wonder if the increased brand awareness is enough to outweigh the resentment it engenders. I’ve heard tell that gun manufacturers pay handsomely to get their wares included in the latest military shooters, and that’s creepy, but in a way, it doesn’t seem as bad to me, because at least guns are relevant to a shooter. They belong there in a way that Earth beverages don’t belong in the Oddworld. The Oddworld setting even gives the whole deal some additional ironies, starting with the way that the whole story is one of struggle against capitalist excess. Putting ads in games is, when you think about it, totally something Glukkons would do. But also, beverage manufacturers in particular were the main bad guys in the previous game. Now, understand that there’s a completely deliberate irony of Abe and the Mudokons using and even relying on the products of their oppressors. Abe’s Oddysee makes it clear that Abe has eaten and enjoyed the Scrab Cakes and Paramite Pies made from his people’s sacred animals, and Abe’s Exoddus has him drinking a Glukkon-made beverage from vending machines as part of solving puzzles, much like he does here in Munch’s Oddysee. But the premise of Abe’s Exoddus is that the Glukkons are using the addictiveness of that very same beverage to re-enslave the Mudokons, and late in the game there’s a revelation about how it’s made that I won’t spoil. As such, I have to wonder if SoBe really thought this through. This is the sort of thing that advertisers tend to be sticklers about. The story of Munch’s Oddysee itself doesn’t seem to contain anything so outright negative about its soft drinks, but the game does make all the cutscenes from Abe’s Exoddus available from its main menu as a recap of the story so far. Considering how ham-handed the product placement is in the first place, I suppose it’s just a matter of nobody involved knowing what they’re doing. The head bad guys of Oddworld are of a species called Glukkons, which have cephalopod-like heads and slender bodies with no arms — or rather, as we learn in the final cutscene of Abe’s Oddysee, their arms are actually the appendages they walk on, while tiny torsos and stunted legs dangle between their shoulders. You don’t see this normally because they wrap their absurd bodies in expensive armless suits that constrain their movements. They are the Oddworld’s personification of capitalist greed, physically incapable of doing anything for themselves, suited only to giving orders. In Abe’s Oddysee, Glukkons only appeared in cutscenes. Both Abe’s Exoddus and Munch’s Oddysee, however, put them into levels, where you can possess them by chanting, just like Sligs. To be more specific, in Munch’s Oddysee, there’s a whole sequence of levels in the midgame based around stealing various Glukkons’ life savings. See, Munch and Abe need to sneak onto a flying-saucer-like lab complex, and the plan to do this involves elevating a particular low-level Glukkon’s position within the Glukkon hierarchy by making him extremely wealthy. It hasn’t been explained yet why this is necessary, but I assume it has to do with transportation to the saucer. Like, it only sends down shuttles to pick up newly-minted gazillionaires or something. At any rate, there’s a sequence of levels where you break into a series of industrial operations, find the Glukkon in charge, possess him, and make him transfer all his assets to Lulu. (That’s the low-level Glukkon’s name, Lulu.) As always, releasing your possession kills the host, so Lulu doesn’t even have to deal with lawsuits or anything afterwards, although I don’t think he’s really complicit at all. Here’s what it means for the game. First of all, the player characters are suddenly proactive. They’re not escaping from someplace, and they’re not reacting to an emergency. They’re doing Mission Impossible stuff. Going on self-contained missions and succeeding at them. Secondly, it provides an impetus for variety, as you visit Glukkons in different lines of business. Or at least, that’s how I imagine it was intended. The fact is, the graphics of this game don’t seem to support much diversity of style. There’s exteriors with rounded cliffs, and there’s interiors with metal walls, and that’s pretty much it. The earlier 2D games definitely had an edge when it came to art. As I’ve said, you can switch between controlling Abe and controlling Munch at the touch of a button. But I find I prefer to use Abe most of the time, switching to Munch only when necessary. Partly this is because Abe gets around better. He can jump a lot higher than Munch, and I think he walks faster as well, although this could be an illusion caused by their different gaits. But mainly I avoid using Munch because he makes this irritating “boing boing boing” as he hops along. It’s especially disappointing because the sound design on the first two Oddworld games was so good, to the point of being a large factor in why I liked them as much as I did. The occasional dramatic drum riffs were particularly satisfying — solid, sharp and resonant. Sure, there were cartoony bits, such as the squeaking of the floor when Abe walked on tiptoe, but that was reasonably restrained and, moreover, usefully informative. Munch’s boing isn’t even the worst of the cartoony sound effects in the game. Abe does much worse when he falls a long distance. But Munch’s walk is much more pervasive and unavoidable, and in addition, Munch is perilously close to being the game’s Scrappy-Doo anyway, being a suddenly-introduced character who doesn’t quite fit in stylistically with what’s gone before and who takes over the story. He’s even proportioned kind of like Scrappy, with that oversized head. I’d have complaints about his voice acting if he had more lines. The thing is, though, all of the Oddworld games I’ve played have had their annoying aspects. In Abe’s Oddysee, it was the doggerel. All the cutscenes were narrated by Abe telling his story in terrible, terrible verse. This was quietly dropped for Abe’s Exoddus, which, however, upped the ante on fart jokes. Abe always had the ability to make fart noises as part of the same in-game speech system that let him say “Follow me!” and “Wait here!”, but in Abe’s Oddysee, there was no in-game reason to do so. Fart noises existed solely for the amusement of those players who found them amusing. Abe’s Exoddus, on the other hand, had a whole mechanic built around drinking fizzy beverages that made Abe gassy, then farting, then chanting to take control of the fart the same way that he takes control of Sligs. Munch’s Oddysee keeps the concept of beverages from vending machines granting special powers, but doesn’t use that specific power. So I’m kind of wondering now if Stranger’s Wrath, the fourth (and, to date, last) Oddworld game, will keep the pattern by dropping the boing sounds and/or getting rid of Munch entirely, but introducing some new annoyance. I have to correct myself on a few points. There still are some captive Mudokons around, distinguishable from the free Mudokons by their headgear. Some of the Sligs do carry guns, although you get something like halfway through the game before this starts happening. And the game does drop the extreme hand-holding eventually. In fact, it more or less announces the fact: the spirit guide who occasionally pops in to give tutorial advice says “I have no idea how you’re going to pull this off”. I’ve started hitting levels where it’s not at all obvious at first where to go and what to do, where the first phase consists of exploration to discover what your options are (and to off the occasional Slig of opportunity). It’s a little like the exploration phase in an adventure game. There’s one big difference between captive Mudokons and free ones: Free ones can be revived if killed. It takes time and costs spooce and is best avoided if possible, but it can be done if necessary. Whereas if a captive Mudokon or Fuzzle is killed, you’re simply locked out of the possibility of a perfect victory, unless you restore an earlier save. And, unlike Abe’s Oddysee, this game really wants you to get perfect victories. There don’t seem to be secret Fuzzles in hidden challenge areas; if there were, Munch could find them with his special sonar ability. Information about how many captives there are on each level and how many you’ve saved is easily accessible in multiple ways: in-world scoreboards, a quick status check on the right trigger button, details available in the pause menu. Really, it gives the player loads of help. And one of the effects of all that help is that it makes perfection seem achievable, so that you don’t risk your rescues without reason. Free Mudokons are your troops of choice when it comes to fighting Sligs, but they’re not always available. Sending your rescued captives into combat carries risk, but sometimes is the best approach. Sometimes you have other options, like having Munch operate a crane and drop explosives on them. But there have already been a couple of cases where I chose the absurdly tedious approach: Send Abe in alone, have him slap the Slig a few times before he gets killed, then have Munch revive him and repeat, gradually wearing the opposition down until victory. I’m fairly certain that this is not actually the optimal approach, but it was completely safe, and the game let me do it. That’s what sort of game this is. The sort that lets you substitute tedium for cleverness. That’s about as far from Abe’s Oddysee as you can get. Oddworld: Munch’s Oddysee has two player characters. First, there’s Abe, hero of the first two Oddworld games and generally acknowledged savior of his people. Despite being an alien in an environment where the design of the aliens is generally rather inventive, Abe is basically humanoid. Then there’s Munch, a member of a newly-introduced aquatic species called Gabbits, which are vaguely frog-like, but with oversized heads and only one central hind leg. It takes a while to establish relative scale, because Munch is at first seen only around completely new alien types, but it turns out that he’s about half Abe’s height. Somehow I got the impression years ago the Munch was female, but that turns out not to be the case — in fact, now that I think about it, there aren’t any female characters in the Oddworld games at all. The first level has you playing as Abe, presumably for familiarity’s sake. This is followed by a few levels as Munch, and after that, they meet up and you play levels with both of them together, switching control between them freely to use each one’s special powers to overcome obstacles. What are those powers? Primarily, Abe can jump and Munch can swim. Also, Abe can chant to possess Slig guards, although this uses up spooce energy — yes, spooce turns out to be good for something other than opening doors. Munch has a cranial implant that lets him operate machinery, obtain power-ups from vending machines, and unlock the cages containing captive Fuzzles. Fuzzles are sort of like tribbles with googly eyes and jaggedy grins. They’re important as a gameplay element because we need something to rescue, and the Mudokons are by now all free. There are still Mudokons around, but they don’t need rescuing; they’re here to assist Abe, mainly by chanting at special doors that can only be opened by a certain number of Mudokons chanting at them simultaneously. This game really likes its special doors. So, Abe can recruit Mudokons and Munch can recruit Fuzzles. In both cases, you can do something with them that the previous Oddworld games didn’t support: you can send them to fight your enemies. Which works because Sligs have apparently forgotten how to use guns. This is a massive change in the character of the series. I remember coveting Oddworld: Munch’s Oddysee back in 2001, when it was an Xbox exclusive. It was Oddworld in 3D! (Tomb-Raider-style behind-the-back view.) That was still a fairly big selling point at the time. Major 2D-to-3D adaptations had existed for about five years at that point, since Mario 64 in 1996, but hadn’t yet really settled down into something formulaic. Some were amazing, and some were terrible, and that very discrepancy made the field as a whole interesting to me. Also, I feel like I must have had a serious jones for collectibles at the time. The main thing I remember from the demo kiosk at my local game store was that it had 3D Abe walking along a trail of little bloblets that disappeared like Pac-Man pellets, incrementing a counter as they went. For some reason, I found this tremendously appealing. These bloblets, it turns out, are called “Spooce bushes”. They contain an energy that, in sufficient quantity, unlocks certain doors. This is pretty much orthogonal to everything else in the game. You just have to collect a certain amount of spooce in addition to your other goals for an area, and you generally do it by following lines of closely-spaced bushes. The bushes grow in lines because their real purpose in the game is to show you where to go. Abe’s spirit guide admits as much in-game. And that’s emblematic of what seems to be a big difference from the first two Oddworld games. I’m about two hours in, and the emphasis is still on following directions rather than solving puzzles. This is the sort of thing people complain about when they complain about the state of games today. The first two games may have been excessively difficult, or at least excessively cruel — certainly the New ‘n’ Tasty remake took numerous steps to reduce the cruelty. Munch’s Oddysee may have been an overcorrection. But we’ll see if that changes over the course of the game. I’ve already started seeing some of the more blatant environmental hintage go away. For the first few levels, every lever or cage or other interactable object has a circular pattern on the floor around it, a sort of “Use this!” marker. Those are starting to disappear. Maybe the spooce lines will go away too after a while. On reaching the end of Oddworld: New ‘n’ Tasty, I realized I was mistaken: I had not been rescuing all the hidden Mudokons as I went along. At the end of the first chapter, all the Mudokons you left behind are immediately killed, and register as such on the in-game scoreboards you can find from time to time, which give the number of Mudokons rescued, killed, and remaining. (One of the game’s more charming aspects is the way it puts out-of-game information of this sort onto in-game billboards and marquee lights.) But it turns out this only applies to the first chapter. Abandoning later Mudokons doesn’t affect the scoreboards at all. Oh, I had found most of them. Enough to get the good ending, certainly — it turns out you only need half. The game is pretty friendly for the completist: you can replay individual chapters, and the Chapter Select menu gives details about per-chapter completion. I wasn’t sure at first if I wanted to take the time to go for 100%, seeing how I had already done so in the original version, but ultimately I decided to go for it. The game isn’t exactly like the original, after all. There was only one chapter where I wasn’t anywhere near completion, and that’s due to a mental trap worth describing. The game starts in Zulag 1 of the meat plant, and when you return to the plant at the end, you enter through the same Zulag. The entryway is recognizable, but everything’s a bit different: enemies in different places, motion detectors where there were no motion detectors before, and of course the passage to Zulag 2 is accessible this time. Now, the basic deal with motion detectors in this game is that they’re frames that move back and forth over a stretch of hallway, and if you don’t stay perfectly still when they’re passing over you, they sound an alarm and trigger something bad, like undodgeable floating mines. The passageway back to the main part of Zulag 1 has something previously unseen: a motion detector that doesn’t move. Staying still while you wait for it to pass over you isn’t an option. Thus, it registered in my mind as an impassable obstacle, a simple way of cutting off the bulk of the level on the second visit. And that seemed reasonable, design-wise. But in fact a stationary motion detector is passable, as long as you can deal with the consequences of triggering it. All I really had to do to access the optional bulk of the chapter was take the detector at a run and keep on running. So, having experienced Oddworld again for the first time in nearly two decades, how was the experience? Compelling enough to keep me going, obviously. This may be technological nostalgia, but there’s something satisfying to me about its use of lighting, with lots of scenes involving silhouettes against saturated color. And the gameplay is basically all about repeatedly overcoming helplessness. You start each area by sneaking and/or running away from things, but gain the upper hand through being cleverer than your foes. That’s always gratifying. I’ve seen reviews and such that say on this basis that Abe’s Oddysee, and by extension its remake, is a nice relief from the gun-blasting violence of other games, but that notion has always struck me as strangely blinkered, coming from a limited notion of what games are or can be. There are lots of nonviolent games out there, and there always have been. Abe’s Oddysee is not one of them. This is a game full of gore, both aimed at and aimed by the player character. This is a game where you explode your enemies by chanting, trick them into walking into land mines or meat grinders, turn into a manifestation of a wrathful nature god and shoot lightning bolts at them, and even occasionally just throw grenades at them. I suspect that what the reviewers found striking was that you spend more time running and hiding than attacking, but at the same time there’s still enough attacking involved to make it seem like a real game to them. That is, it’s strikingly nonviolent for such a violent game. At any rate, it’s been enjoyable enough that I think I’ll continue on to an Oddworld game that I haven’t played yet.